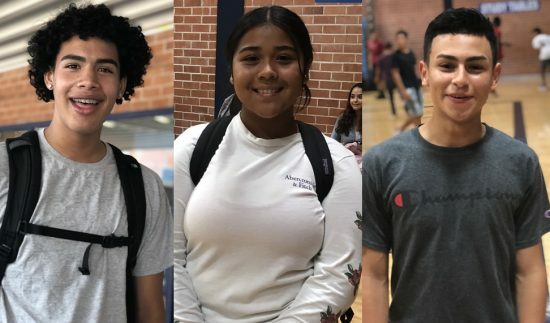 Thursday, Aug. 2, 2018, wasn’t just the first day for nearly 1,850 students but the first day for incoming freshmen (the Class of 2022), ready to experience their first year of high school at Pueblo. This year, Pueblo can boast 444 freshmen; that number is up from last year, when we had 410 freshmen, according to Ms. Rachel Apalategui, Pueblo’s registrar. One new Pueblo freshman, Marie Romero, attended Hollinger K-8 during her middle school years and admitted that she is prepared for her high school experience. Another Warrior freshman, William Santos, who attended Roberts Naylor K-8 school, said that he had no fear when it came to attending Pueblo. Tanya Rivera, also from the Class of 2022, also attended Hollinger K-8, said that she is currently getting the high school vibe. “I look forward to learning how to play the flute and making new friends,” Rivera said. Freshman Jesus Romero attended Pistor Middle School prior to officially becoming a Warrior, and he said that he had a very exciting first day as a high school student. “My plan is to earn good grades the entire year and be a part of the Pueblo High School wrestling team,” he said. Daidryan Mendivil, who graduated from South Gate Middle School last spring, said the he had an easy transition from middle school to high school. Mendivil said that he plans to stay committed to a few sports and clubs. In fact, he already joined TRIO, a club that focuses on students’ collegiate futures. Freshman (and sophomore) counselor Ms. Marian Finely has some great advice for our freshmen to be successful this year and for the remainder of the school year.